Long before Doctor Fingal Flahertie O'Reilly became a fixture in the colourful Irish village of Ballybucklebo, he was a young M.B. with plans to marry midwife Dierdre Mawhinney. Those plans were complicated by the outbreak of World War II and the call of duty. Assigned to the HMS Warspite, a formidable 30,000-ton battleship, Surgeon Lieutenant O'Reilly soon found himself face-to-face with the hardships of war, tending to the dreadnought's crew of 1,200 as well as to the many casualties brought aboard. Life in Ballybuckebo is a far cry from the strife of war, but over two decades later O'Reilly and his younger colleagues still have plenty of challenges: an outbreak of German measles, the odd tropical disease, a hard-fought pie-baking contest, and a local man whose mule-headed adherence to tradition is standing in the way of his son's future. Now older and wiser, O'Reilly has prescriptions for whatever ails...until a secret from the past threatens to unravel his own peace of mind. 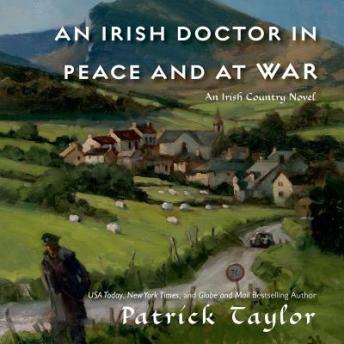 Shifting deftly between two very different eras, Patrick Taylor's latest Irish Country novel reveals more about O'Reilly's tumultuous past, even as Ballybucklebo faces the future in its own singular fashion.